The current dysfunctional state of Irish football was perfectly encapsulated by an incident at Turners Cross on Friday night. As fans of Cork City unfurled a banner reading "Delaney Out", they were confronted by stewards who apparently requested the assistance of gardaí to eject a man from the ground. But what makes it utterly bizarre is that he was Jonathan O'Brien, the Sinn Féin TD for Cork North Central who had, a few days earlier, as a member of the Oireachtas Committee on Sport, rigorously questioned FAI executive vice-president John Delaney about the scandals engulfing the association and its former CEO. Irish sport has known few days as strange as these. The chickens are coming home to roost in such numbers they resemble a swarm of locusts. But this story is bigger than John Delaney. It's even bigger than John Delaney's credit card bill. It appears likely that Delaney will quit the FAI, riding off into the sunset to Uefa. But things cannot stop there. 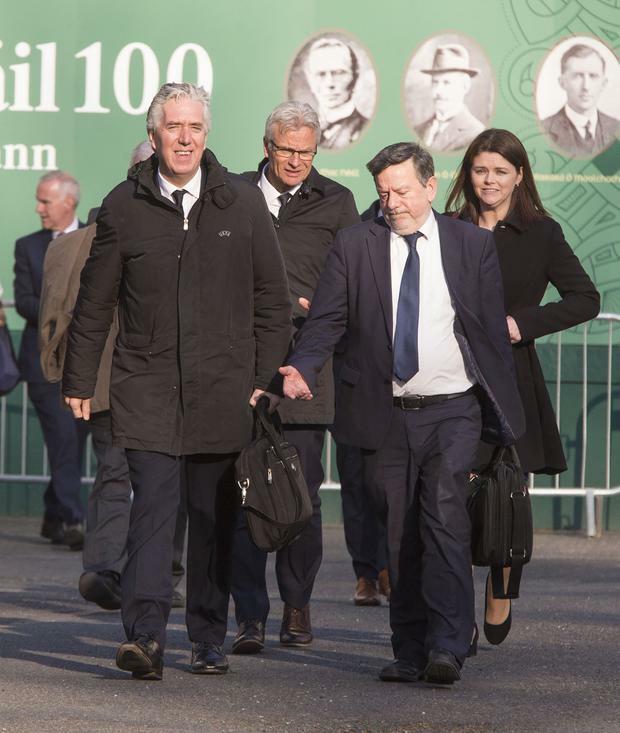 The FAI has become the Augean Stables of Irish sport and nothing less than a complete clear-out of the association's top echelon will do. Delaney's visit to the Oireachtas Committee was probably the most ill-advised public appearance in Irish life since Pádraig Flynn's 'Class Act' number on the 'Late Late Show'. By turning up and then refusing to answer questions related to the matter under investigation, he ended up with the worst of both worlds, alienating sponsors, leagues, players organisations and others previously inclined to hold fire. The FAI's decision to plump for obfuscation and evasion proved a disastrous one. Yet this pound-shop Machiavellianism was hardly the brainchild of Delaney alone. Everyone who accompanied him must have also signed up to the strategy. The united front presented by the FAI to the Committee indicated a desire to hang together. So that is what they'll have to do. When Pat Hickey left the Olympic Council of Ireland, he was followed by almost all his allies. The same thing must happen in the FAI when Hickey's protégé departs. Delaney was enabled to treat the FAI as his personal plaything by the ineffectiveness of the board. Board members went along with the idea to create the executive vice-president post soon after newspaper queries about the controversial €100,000 'bridging loan'. They also allowed it to be stated that they'd known about this loan. A while later, they remembered that they hadn't. Nobody on the FAI team at the committee hearing wanted to reveal who was responsible for this misinformation. They claimed they couldn't remember and pledged to get back to the committee. They still haven't done so. John Delaney is not the association's only stonewall specialist. Had Delaney secured an injunction preventing the 'Sunday Times' from publishing the story about the loan, the FAI would have gone on pretending everything was hunky dory. None of the current revelations would have come to light and the CEO would still be living high on the hog. Dr Samuel Johnson once observed that: "The Irish are a fair people. They never speak well of each other." Had the current revelations not emerged, it's probable we would have remained in ignorance about the delays faced by League of Ireland clubs in receiving prize money, the FAI's astounding laissez-faire attitude towards accounts and the enormous amount of money lavished on the CEO of an association dogged by cash-flow problems. One of the ironies of the story is that Delaney's famous litigiousness utterly backfired. Seeking an injunction only served to increase interest in the €100,000 'loan', heightening the sense that this was not just some routine bit of business. Fans at home internationals found stewards intervening heavy-handedly if they dared to express dissent against Delaney. Irish fans travelling abroad found the same policy adopted in other countries, presumably in response to FAI requests. Cork's over-reaction stems from a climate in which cash-strapped League of Ireland clubs feared that fines would follow any expression, no matter how mild, of disenchantment with the big chief. Contrast Delaney's weird hypersensitivity with how Jonathan O'Brien behaved after the injustice of Friday night. The TD made no fuss, graciously accepted the apology and said he'd be back at Turners Cross for the next match. That's what the best people in Irish football have always done, put the head down, stay working and keep turning up. Such people deserve better than the FAI. Double Del Boy's six-month credit card bill and add it to his rent which the association also covered, and you get an annual total of €116,000. The prize money for winning last year's League of Ireland title was €110,000. It's an insane state of affairs. Delaney's Donkeys, temporarily lazy and permanently tired, can aid the process of recovery by following their boss into oblivion.